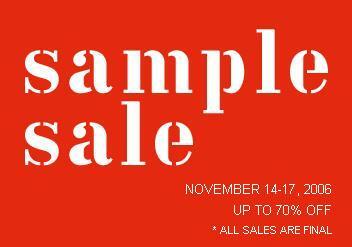 Exclusive Online Sample Sale, Limited Time Only!!! Kate Spade New York has announced its online sample sale so here's your chance to purchase Kate Spade items at an exclusive discount. Items are up to 70% off the original retail price. The sale ends November 17, 2006 and with limited stock, be sure to act quickly! Click on the image for full details.